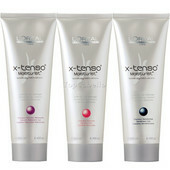 At last, an alternative to traditional straightening productsL'Oréal Professionnel X-Tenso. A service that offers long lasting smoothness and easy styling whilst respecting the beauty and condition of the hair. A specific result for each hair texture: naturally curly, frizzy, voluminous and ultra frizzy voluminous.